European regulators have confirmed tough restrictions on the bonuses that banks can pay their staff. Only 20-30% of bonuses can be paid in upfront cash, according to new guidelines announced by the Committee of European Banking Supervisors (CEBS). The rules are much tougher than those agreed by the G20 countries, raising fears that bankers may emigrate to more lightly-regulated countries. 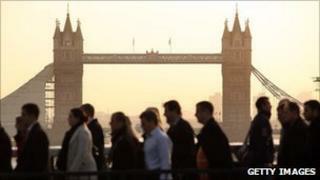 The British Bankers' Association called it a "dramatic" change. Although the guidelines for European national financial regulators are not obligatory, a spokesman for the Financial Services Authority (FSA) confirmed that the UK bank watchdog and its European counterparts intend to implement them in detail. The guidelines could mark a profound change in the City bonus culture. In the past, star performers have been able to negotiate big pay deals by threatening to quit and work for a rival bank. But the new rules mean that any banker that did leave would forfeit years-worth of deferred bonus payments. "[The] CEBS announcement, on top of the FSA rules, changes dramatically the bonus landscape," said the British Bankers' Association in a press release. "We maintain that reform of the remuneration system in financial services must be globally coordinated. "We now need other jurisdictions, notably the USA and emerging markets, to coordinate their reforms with the EU rules." The rules may even be welcomed by the banks at a time when they are under pressure from markets and regulators to build much bigger capital cushions to absorb future loan losses. By helping them cut back their staff costs, the banks can add the saved money to their capital. The finalised CEBS guidelines for national financial regulators are virtually unchanged from the draft rules circulated in October. publish pay details for "senior management and risk takers". The rules would mean that bankers receive only 20-30% of their bonuses in immediate cash. Banks will be required to implement the rules by 1 January, meaning they will affect bonuses for the current year, which will be paid out in January-February. The bonus limits will apply to the entire global staff of European banks. However, non-European banks will only face restrictions on what they pay staff working for subsidiaries based in the European Economic Area (the European Union plus Norway and Iceland). Some European banks have warned that the rules create an added incentive for their employees to relocate to Asian cities such as Singapore that have looser bonus rules, as well as lower tax rates and access to Asia's booming economies. Moreover, according to the BBC's business editor, Robert Peston, British banks HSBC and Standard Chartered have voiced concerns that they might lose Asian staff to non-European competitors because the bonus rules apply to their worldwide staff - including those in Asia. And although they have made no such threat, the rules may encourage the two banks to move their corporate headquarters to Asia in order to avoid having to apply the rules to employees located outside Europe. The rules will not apply to Switzerland, a major international banking centre that is not part of the European Economic Area. However, the Swiss imposed their own minimum pay standards on banks at the beginning of this year, although their rules do not contain any explicit limit on how much bonus can be paid upfront in cash. Those operating within the European banking industry said the new rules needed to be applied across the world so that European banks were not disadvantaged. "These requirements will mean that banks operating in Europe, and European banks operating elsewhere in the world, will be at a competitive disadvantage unless there is recognition of the need for a global agreement on compensation practices," said Simon Lewis, chief executive of the Association for Financial Markets in Europe, a banking lobby. Meanwhile the CEBS is also preparing a new and much more rigorous round of stress tests for Europe's banks. They follow the near-collapse of the Irish Republic's banks, despite the fact that they passed a previous round of stress tests held over the summer. The new tests will be used to determine how much additional capital banks must take on to absorb potential losses on their investments. Several international figures, including former UK Prime Minister Gordon Brown, have called on European leaders to massively recapitalise their banks in order to avoid the risk that the European sovereign debt crisis could trigger a banking collapse. The original stress tests were heavily criticised for failing to consider the possibility that a European government may default on its debts.